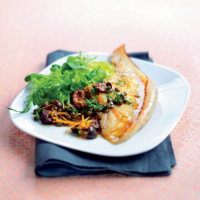 This is classic ray (also called skate) with black butter with a Sicilian twist, courtesy of chopped olives and orange zest – flavours that work well against the strands of succulent fish. Preheat the grill to medium high. Line a roasting tray with foil and place the ray wings on top. Put the butter in a small saucepan over a medium heat with the orange zest, herbs, salt and pepper. Once the butter is melted, brush some over the ray wings on both sides. Place them under the grill for 4 minutes each side until the flesh is opaque. Turn the heat up under the remaining butter, add the capers and olives, then cook until golden. Take off the heat, splash in the orange and lemon juice and pour onto the fish. A dry white with a hint of oak is perfect for the orangey ray.